Description: Round, oval, or obvoid in shape, up to 12 inches long, smooth skin, grooved, ribbed or netted, varieties vary in color. 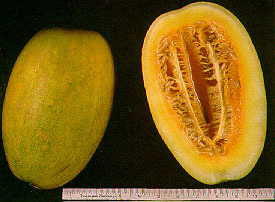 Family Characteristics: The Cucurbitaceae contains over 90 genera and 750 species. They are predominately warm season crops of tropical and temperate subtropical origin, many of which thrive in hot and humid conditions. Members of this family are known as vine crops, having a prostrate or climbing nature, and are characterized by tendrils. Most are herbaceous annuals, few are perennials, and all are frost sensitive. Melons are known to contribute to a person's health by being a rich source of beta-carotene (for muskmelon), but are less well known for their ascorbic acid, carbohydrate, dietary fiber, potassium, calcium and iron contents. Melons have at least thirty-eight (38) of these chemical compounds with beneficial human biological activities. These compounds are called phytochemicals and can have anti-arthritic, cataract, cold, depressant, glaucomic, migraine, obesity, parkinson, ulcer, properties in addition to cancer-preventive attributes. and used against certain types of Intestinal Parasites. Eat the fruit be it either a natural, in salads or as a drink. Drink on an empty stomach a glass of Melon Horchata prepared with Melon seeds, water and sugar to taste.